Warm a large pan over a medium to low heat. Add the butter and the onion and fry gently for 10 minutes or until softened but not coloured. 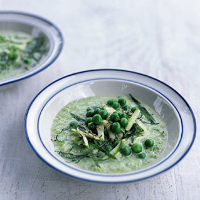 Coarsely grate the courgettes and place four heaped tablespoons into a bowl with 2 tbsp of petits pois and set aside. Tip the remaining courgettes and peas into the pan. Mix well to coat in the butter. Add the stock and increase the heat. Bring to the boil and cook for 5 minutes or until the peas are just tender. Remove from the heat. Finely shred the mint leaves. Mix 2 teaspoons of mint into the bowl with the uncooked vegetables. Add the rest of the mint to the pan together with the cream. Blitz the ingredients in the pan with a hand blender (or use a food processor) until completely smooth. Season to taste. Return to the heat and cook until the soup returns to serving temperature. Ladle the hot soup into shallow bowls. Mix the lemon zest into the reserved bowl of uncooked vegetables. Spoon this mixture into the centre of each bowl and serve with plenty of freshly ground black pepper.